Private messaging between businesses and consumers on Facebook has come a long way since it was first introduced in late 2011. Many enhancements over the years, including the emergence of Facebook Messenger as an effective channel for business-consumer dialogue, have established Facebook as a powerful platform for social customer care. And, with more than 800 million people using Facebook Messenger each month, private messaging continues to be an increasingly important channel for businesses to communicate with customers. Today, we’re complementing our existing Facebook Messenger capabilities in the Smart Inbox with enhanced Private Messaging features that empower Pages to effectively engage in one-to-one conversations with consumers. 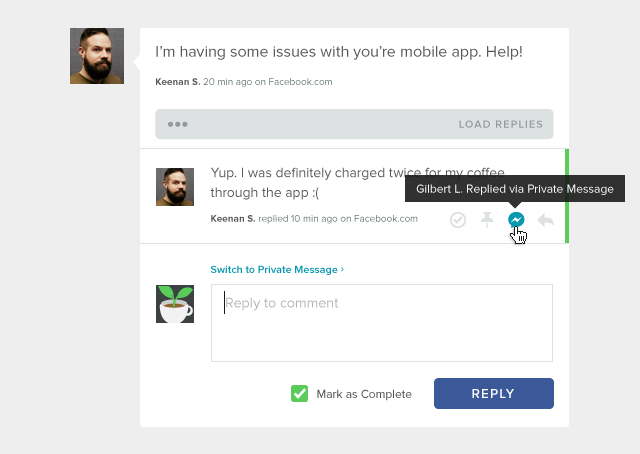 Within Sprout you can now reply to public comments on your Page posts via Private Message. The comment threads of your Page posts are a prime space for engaging with your customers. As you share content about new products, promotional campaigns or company updates, it’s natural that your customers may have questions or feedback. Sometimes, the public comment thread is an appropriate place to respond to customer comments. Other times, it’s safer and more effective to transition a conversation to Private Message and address more sensitive requests and comments such as billing issues, shipping inquiries or the occasional irate customer. 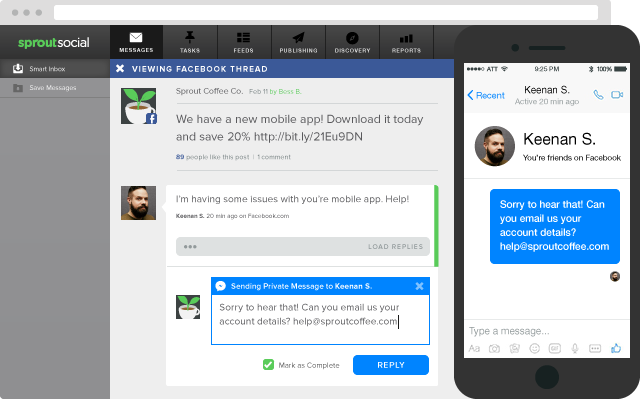 Now you can transition from a public comment reply to a Private Message from Sprout’s Facebook Comment Thread view. Simply click the new ‘Switch to Private Message’ prompt located above the text input field. Upon switching to reply via Private Message, you’ll notice the Facebook Messenger icon appear across the top of the text field alongside the name of the Facebook user to whom you are replying. Once you’ve replied to a comment via Private Message, you can easily jump to the entire Private Message conversation thread. Within Sprout you can access individual Private Message conversation history by clicking the new Facebook Messenger reply tracker icon available in the Facebook Comment Thread view. The message recipient can view and reply to your conversation from the Facebook Messenger app just as they would any other Private Message. This simple yet powerful workflow allows you to effortlessly and privately respond to your customers on Facebook anytime, anywhere—even across devices. Facebook Messenger has reinvented how consumers reach businesses. No longer do customers expect to wait on hold or navigate convoluted touch-tone phone trees to find the answers they seek. Instead, they turn to Facebook Messenger and chat with businesses in the same way they text their friends. As more and more Facebook users turn to Messenger for customer care, it’s becoming increasingly important that businesses have a streamlined way to respond to and manage public and private conversations. Enter: Sprout’s Smart Inbox. With a suite of collaborative message management tools for Facebook, the Smart Inbox helps social customer care teams work together to effectively respond to wall posts, comments, Private Messages and Facebook Messenger conversations from a single, unified feed. Today’s update to respond privately to public Page post comments and Sprout’s existing Facebook management tools for business enable social care teams to operate more efficiently and ensure an incredible customer experience on Facebook. As always, let us know if you have feedback and stay tuned for more updates coming soon.